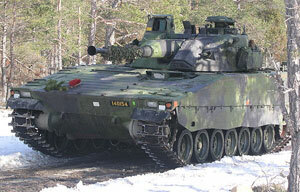 The Combat Vehicle 90 (CV90) or Stridsfordon 90 (Strf 90) is a Swedish infantry fighting vehicle. ISO Group provides spare parts and solutions for all CV-90 variants: CV9040, CV9030, CV9035, CV90105, CV90120-T CV9040 AAV (TriAD), CV9040B, CV9040C, and CV9056. ISO Group has experience in the CV90 series: Engine Assemblies, Drivetrain, Transmission, Trackshoes, Electrical Assemblies, Weapons Systems, and Accessories. Follow the links below or call for more detailed information.